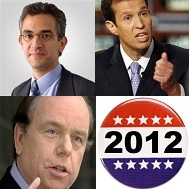 On November 17, 2011 The Common Good presented a special “Election Panel 2012” with three of the best experts on election strategy. A powerful bipartisan trio – Ken Mehlman, the brilliant former Chair of the Republican National Committee, Robert Shrum, the amazingly clever Democratic political strategist and messaging expert, and Richard Wolffe, author and journalist, known as a keen observer of the American political scene, gave a frank discussion and prognostication of the American political landscape. A truly memorable evening.